Here at Walk in Wardrobe we have completely fallen in love with the cold shoulder look and have been regularly sporting cold shoulder dresses and tops over the past few months. 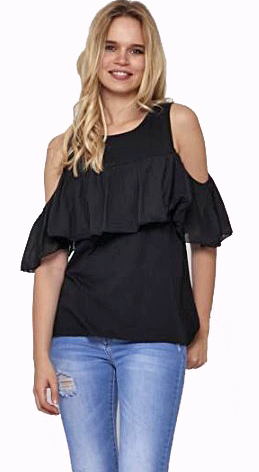 A cold shoulder top at it’s simplest is an ordinary top with peekaboo holes at the shoulders. So why would anyone wear tops and dresses with holes in?! Because they are quite simply a MUST for the summer months! Exposing the bare shoulders adds a bit of edginess and sexiness to a look without being too risqué, it is just the perfect combination of sweet and sassy. It’s not only the look which is a massive selling point of these dresses and tops, they are also wonderfully practical too. Unlike off the shoulder tops and dresses, you can wear an ordinary bra and are perfect if you want to stay cool in the summer but are not 100% comfortable with showing your arms off. No matter what your shape and size, cold shoulder tops absolutely suit everyone. As cold shoulder outfit designer Donna Karan stated, women never complain about their shoulders! Wearing as little clothing as possible doesn’t necessarily mean that you will feel cooler. The trick is to cover up a bit and wear loose clothing which will allow air to flow around your body. This extra layer will also protect your skin from the sun (big bonus if you are prone to sun burn!) as it will provide you with some shade as you waft about like a summer goddess. Kaftan tops are a gorgeous addition to any summer wardrobe, giving you the practical benefits of keeping cool whilst also looking amazing. If you are a lady who likes to hide her arms, kaftans are also a real boon! This stunning full length kaftan to the right fuses bold, bright summer colours with an exotic print. As it is 100% silk, it is a natural fiber which is perfect for the hot summer months due to the fact that it is super breathable and helps you to maintain a natural temperature. Capri pants (aka cropped trousers) are fabulous if you want to stay cool but not show off too much leg. Try to make sure that you get capri pants which finish in between the knee and ankle (a good length is pictured left). Tight fitting capri pants are best for a modern look. Pictured left are our capri style pants which look great with loose fitting boho tunic tops for a contemporary, modern look. Our capri pants come in a gorgeous array of colours such as fuchsia, navy blue, black, white and dove grey. Sleeveless jumpsuits are very much in fashion this summer 2015. Pictured right is a fabulous style we have at the boutique and is a relaxed yet classy jumpsuit with a fabulous print. What I particularly love about this style is it’s versatility. It can be dressed down for the day time, coupled with a belt or just wear it as is, and for the evening time, jazz it up with a few blingy accessories for a classy and sophisticated look. You can even add a cropped jacket if you are going to a more formal evening party to make it look a bit smarter. If you are lucky enough to be in the Stewards’ Enclosure, make sure that the hem of your dress is below the knee as knee flashing is a definite no-no! Likewise, make sure that you are not wearing divided skirts, culottes or trousers. This figure flattering floral pencil dress pictured on the left is an excellent example of a great dress for Henley Regatta. This style of dress looks fabulous on many different body shapes including curvy, hour-glass and tall and willowy. The gorgeous floral pattern adds vivid splashes of colours to ensure that you will stand out from the crowd. 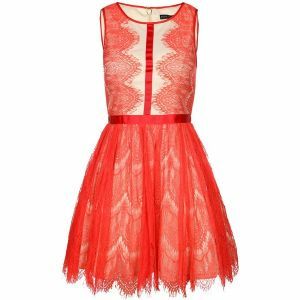 This dress looks great with black shoes and a bright fascinator or hat to match the print. Check out that length too – not a flash of knee in sight! Hats are not a requirement at Henley, but they have stated that it is customary to wear one. If you are concerned that a hat may be too much, a fascinator is an excellent alternative that wont block the view of anyone who is behind you who wants to take in the rowing! 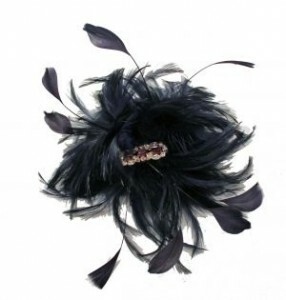 This stunning, handmade, vintage inspired fascinator is a delicate alternative to a hat with gorgeous feathers and subtle bling. Although there are no formal requirements for shoes, the right footwear can really make the outfit. However, be mindful that for much of the event you will be tottering about on grass, so make sure that your shoes are sensible as well as fabulous! 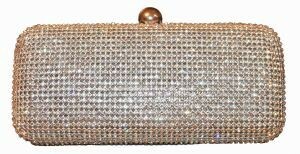 Don’t forget to finish off your outfit with a gorgeous bag. If you are wearing a patterned dress, pick out the secondary or tertiary colour to match the bag with, it’s a great way to accent the other colours. If your dress is one colour, match it to the colour of your shoes or hat to break up the colour. If you are having problems colour matching, go for a trusty bag with clear sparkles (like the one on the left) – they look gorgeous with anything! So, if you are lucky enough to be a ticket holder for the regatta, have a fantastic time and enjoy a Pimms for me! Long prom dress £89.99 – UNDER £100! The high street stores are awash with cheap prom dresses galore, so you may be considering going to purchase one from one of the many that are out there. Your pull towards a high street store may be due to reasons including the big one; because they offer cheaper dresses than more exclusive, independent boutiques. This is a common misconception amongst many shoppers, at least in our case! Walk in Wardrobe HQ have been busily sourcing stunningly beautiful dresses for prom 2015, the majority of which either match or beat the high street stores in price! Whilst high street chain stores do have their place in shopping for fast fashion, I would still not shop in one if I was going to attend a special event. There are several reasons for this, the main one being that I would want a dress for my special event which screams good quality as well as being unlike anything anyone else would wear. I wouldn’t settle for anything less, so why should you?! The dresses we provide are uniquely handpicked by our exceptional buying team who look for: excellent designs that are not mass-produced, good quality workmanship and good quality fabric. Our rule of only providing quality items means that if you look after your dress from Walk in Wardrobe well enough, it can last for years, meaning that you are getting true value for money and you will have a distinctive and unique dress which will really make you stand out from the crowd! Prom dress by Forever Unique 65 RRP £345. Secondly, as you are going to a special event, don’t you need special customer service? The customer service culture amongst high street chain stores is very different to the customer service you can expect from an independent boutique. We offer a fun, relaxed and friendly atmosphere where we can take the time to assess the individual customer’s needs and we like to get to know them personally so we can help them choose a dress which will reflect their personality for their special occasion. Unlike the high street chain stores, we also offer a hiring service, which means that you can get that designer look for a fraction of the cost and it also means that you can save on space in the wardrobe! We also never release the same dress to the same function, so shopping with us also means that you will never be in that embarrassing situation where you turn up to a function and someone else is wearing the same dress as you! Although we never like to put a dampener on things, I think you will admit that after a glorious few weeks of sunshine the weather has now taken a turn and it is now rather cold. So as we do away with our floaty summer dresses, we get busy pulling on our jumpers, snuggling up into our winter wear and enjoy a good mug of tomato soup on the sofa. Bliss! This change in weather obviously means that we will have to reassess our wardrobes and find the most glamorous way to keep warm this winter. Don’t worry, there is definitely one way of staying glam whilst keeping the chill off this winter which does not involve a cumbersome overcoat, and it comes in the form of the cape coat. 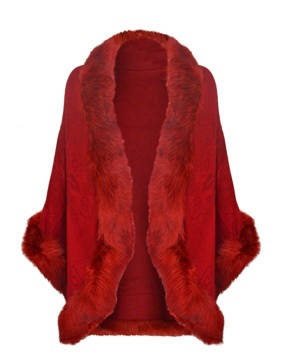 Capes are no longer purely reserved for Little Red Riding Hood and that lovely lady from Scottish Widows, they have in fact become a winter staple for 2014 and have been spotted all over this season’s runways, it’s only a matter of time for them to trickle down onto the high street! As well as being this season’s coolest way of covering up, capes are brilliant at transforming a casual outfit into a cool, feminine and glamorous one. These capes look fabulous with skirts, thick tights, knee high boots, skinny jeans, heels for the evening etc. In short, they look amazing with almost anything! The best thing about them? It’s got to be the fact that you can just throw them on with stylish ease!